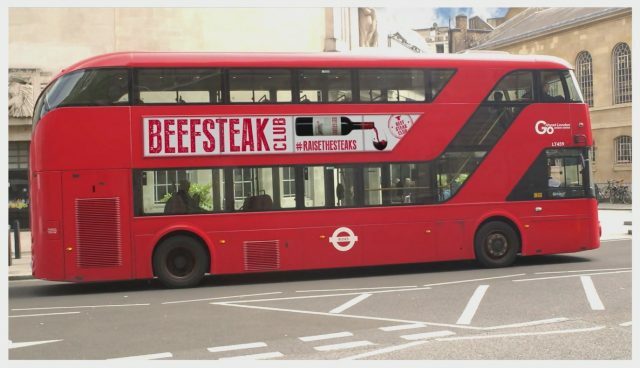 Ehrmanns-owned wine brand Beefsteak Club has launched an advertising campaign which is to be featured on London buses, tying in with a social media campaign which is giving away a free bottle of wine. Throughout September, London Routemaster buses will carry Beefsteak Club branding on a number of central London routes. This ties in with a social media campaign on Facebook, Twitter and Instagram where participants are encouraged to upload an image of a Beefsteak Club bus with the hashtag #RaiseTheSteaks to be in with a chance of winning a bottle of wine. The campaign coincides with a series of launches for the brand which has seen its Australian Limestone Coast Shiraz hit Sainsbury’s stores, with two more of its wines due to be unveiled in two other major UK retailers. Ehrmanns’ marketing manager Susannah Taylor commented: “The Beefsteak Club brand is going from strength to strength in the UK and internationally, it is now available in over twenty-five countries. We continue to develop the Beefsteak Club range in partnership with key retailers, while supporting the growth of the brand by raising consumer awareness through a combination of out of home and digital marketing activity”. Is it members only? What are the criteria for membership?